As the days are beginning to get longer, and with the marks on the thermometer occasionally rising to spring temperatures, the deepest and darkest part of winter seems to be slowly becoming a thing of the past! The two-part playtime series with the new wardrobe additions starts with end of winter/mid-season looks, and in case of a cold spell, you can always add a warm and cosy winter coat, sweater or shawl for warmth. 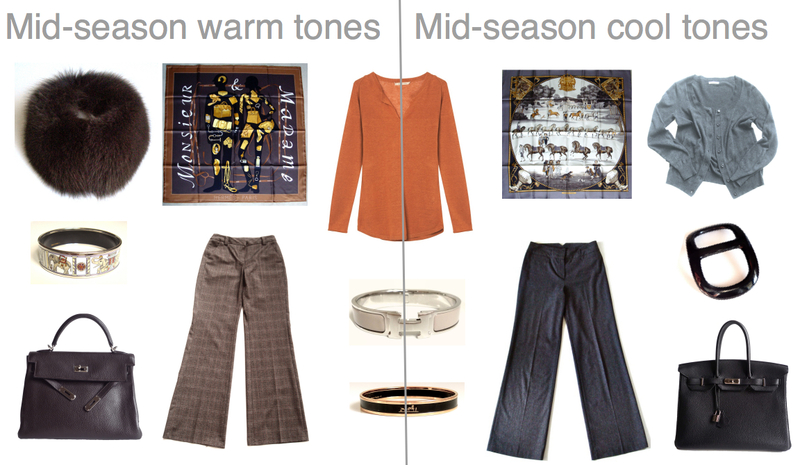 Capsule wardrobe pieces: burnt orange linen sweater with checked wool trousers (warm tones) and grey cardigan an flannel trousers (cool tones). 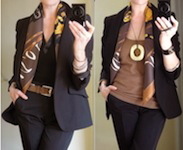 Accessories (warm tones): Hermès 'Mr et Mme' 90 carré, 'Elephant' printed enamel bracelet and 32 Kelly in ebene. MaiTai Collection scarf fur collar in mocca. Scarf worn in five-loop method. Accessories (cool tones): Hermès 'La Presentation de Chevaux' 90 carré, 'Caleche' printed enamel bracelet and 35 Birkin in black. 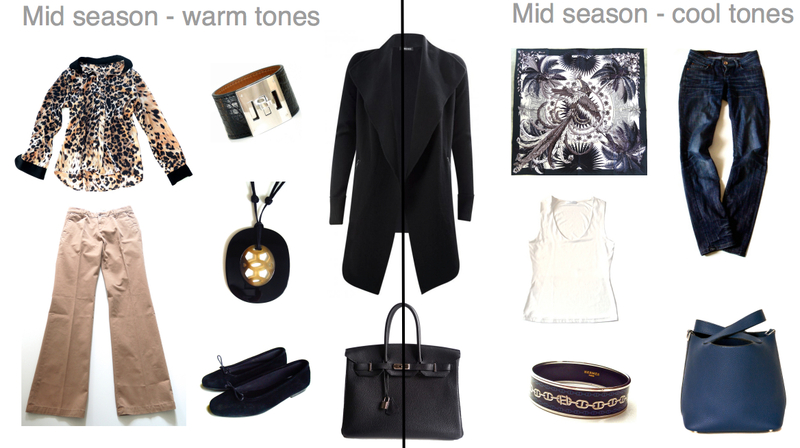 MaiTai Collection shawl ring in black horn, scarf worn in a basic slide. Accessories (warm tones): Kelly Dog bracelet in black croc and Lift pendant in black. We left yesterday for our annual skiing holidays, and I'm looking forward to catch up with you in a couple of weeks. Part #2 of the wardrobe additions features early spring looks, and will be posted remotely in a weeks time. Your new additions are beautiful, classic, and versatile -- just like you dear MaiTai! I especially love your burnt orange linen sweater, such a warm cozy color. Love how you paired the new with your existing pieces, all so pretty. Love the burnt orange, so elegant and a touch of leopards is always such a beautiful touch. Enjoy your creeping up temps..wish I could say the same! Thanks so much, dear Enchanted! For the moment no more spring for us either... yesterday we drove past blossoming almond trees, but when approaching the Alps a few hours later, were caught up in a huge snow storm...brrrr! You always look wonderful!!! It is always a joy to see your fashion. Merci pour votre gentil commentaire, chère Véronique. Le pull orangé est un vrai coup de coeur, et au même temps un veritable multitalent. Bonne semaine! I love this post! Your new burnt orange sweater is so beautiful! As Simone said, like you are! I have tried to order it from GD's homepage but apparently they do not send to Denmark. I might call them tomorrow. Hopefully you will have great weather! Awwh, darling MT, no tease taken! You have provided us a great springboard with which to launch our very own capsule pieces! The burnt orange sweater seems to have caught everyone's eye as a shot of color is so appealing at this time of year! Enjoy your snow storm and get ready to tackle that powder pack soon! Trudye, doesn't it kill you that we can't get these lovely things here? I checked their websites, too, and one of them ships to Latvia of all places. Yes, I know they wear clothes in Latvia and probably appreciate warm, lovely cashmere pieces, but heck, if they can ship there, wouldn't you think they could ship to us in the US? Hello, FedEx was born here! I would think that they'd be opening stores here like crazy, too. Maybe they're afraid of Ralph Lauren and Calvin Klein! But, Manuela, it's certainly good news for you, and you would look lovely in the orange sweater. I hope you can snag one. Just wanted to let you know that Bloomingdales in Chicago has a GD section that's wonderful! They don't put the merchandise online but will accept calls! Annie, that's great news and thanks for the tip. I might pop by the B'dales here in Atlanta and see if they, too, carry a selection from the line. Isn't it funny that we'll all spend much time and effort in tracking down things we can't readily have? Tell me I can't have something, and that makes me want it all the more! Oooh, Annie, good news about Bloomie's in Chicago - thanks for the tip! Dear Jerrine, hope you are staying warm and dry. Lovely Manuela, I hope to see the orange GD on you in a future MT collage! Dearest Trudye, you are so right about longing for beautiful colors this time of year. There is a clutch of bright yellow daffodils on my credenza at home, all massed together so they are pretty much screaming "YELLOW!" at me when I walk in the door. Loving it! Jerrine, it is a tad frustrating I agree! Think this darn weather has us all ready for a little brightness! Be it an ever elusive sweater or fresh flowers that you darling Fifi have in the entry, I know my eyes are seeking color! I picked up a bunch of bright orange tulips at Whole Foods today and love that pop of orange! Annie, thank you so much for the Bloomie's intel! We do not have one here so I will wait to hear what Jerrine can find out! We are just shy of sleet in Houston,but cold and drizzly enough! To think it was 78F here on Sunday...crazy! Everyone stay warm and safe and keep dreaming those Orange dreams! Yeah, Manuela, oatmeal will be lovely on you! In my pretend wardrobe, I even like the navy one they have up! Look forward to modeling pics! J'adore ton pull Darel la couleur est vraiment superbe. Je vous souhaite de bonnes vacances en espérant que tu n 'as pas étais bloquée sur la route . Playtime it is, darling friend! I love the pairings posted here! I think we all would love the orange linen GD sweater! Truly a fab find! Love how you posted the warm/cool tones side by side. It makes it fun to imagine mixing and matching across the lines! Dear MaiTai, Love your pairing with your fab new buy I loved them all from your last posts especially the orange top gorg , also love the way you have showed us how to pair with the warm/cool tones side by side so easy to see. Enjoy your winter holiday hope the snow is perfect for you. Love the new purchases ,well chosen as usual. I particularly like the cool tones being fair skinned and blonde myself. But I think you can wear both tones so well. Enjoy your ski holiday. N. J. Thank you, N.J. Adding new wardrobe pieces is always such fun, happy you like them! Mai Tai, you've become my fashion guru! Now I can see how a few changes in an outfit make it warm or cool. And add me to the list of salon ladies who love that orange GD sweater! Enjoy your holiday! Thanks so much, dearest Annie.How I wish I could just pull enough orange sweater for all Salon ladies out of magic hat.. working on a spell as we speak! It's always so satisfying when new pieces and trusted staples join into fresh new looks, happy you enjoyed the post. Have a wonderful spring ahead! Dearest MaiTai, that new coat is so versatile! And are those hazelnuts all netted up so beautifully in the basket? They are my favorite nut. Have a wonderful time skiing and enjoying your family! While, I'd like to say that our temperatures are rising and the dark days of winter are nearing a close, I can't. It's sleeting here, and we may get snow tomorrow. All the poor mothers are going crazy, as they were housebound with their kiddies all of last week, and it looks like much of the same this week. Anyway, enough about the weather woes. MT, you look especially radiant in that burnt orange linen sweater, but it's that black, leather trimmed coat that I truly covet. So wish we could get these things here. I may have to move to Latvia, and I'm not even sure where Latvia is, only that those lucky people can get these lovely pieces. Enjoy your trip. I hope the weather has cleared, and you're schussing happily down the slopes. Ok,girl, stop by and pick me up on your way to Latvia! Not exactly sure about where it is either...kind of sort of know the vicinity! We would be the cutest girls there decked out in GD with a little H thrown in! Besides the linen sweater, I am loving that coat, too! Such great finds,all, by our fearless leader! You stay warm and keep me posted on the Bloomie's intel! Fingers crossed that we all have enough firewood to make it to Winter's end! Make an offer. Maybe you could buy it from that Pinterest poster, Trudye! It's turning very dire in terms of weather here today. We have a major ice and snow storm bearing down on us, and they want us off the roads no later than 2 p.m. They've closed down all the schools and anything they can and will probably ban large trucks on the interstates, considering the problems they had with them last year. It's supposed to snow through tonight, and then everything will freeze on tomorrow night, making driving impossible even Friday morning, as well as my trip to the airport. Will probably need to cancel flight, darn it. Salon Swans, I live in the South. This is not supposed to be happening here at the end of February. Trudye, can I come live with you? Maybe we can go to Latvia. The weather is probably better. Now listen to the authorities,Jerrine, and stay off of those roads! No, those of us in the South are not used to this weather nor do our cites, states have the proper road equipment to deal with it! Be safe! My guest bedroom is ready and waiting anytime! I think Latvia may be even colder than Atlanta,so head on over to H town...if you can get to the airport! Something very similar, but not as long, on RL website on sale. They have a cardigan and coat version. Make sure those furbies are safe,too! A safe and warmer weekend to all and good snow and visibility for our leader. I know that rhymes w/ Brrrrrrrrrrrrrrrrrrrrrrrrrrrrrrrrrrrrrrrrrrrrrrrr, but how 'bout pronouncing "Jerr" w/ more "e" than "er"?!? I've been watching the weather reports in the news, OMG, it's the South. It's supposed to be warm. Please please, don't drive, as many friends here have urged. Southerners are not 'seasoned' snow/sleet/ice storm drivers, well, and they really shouldn't be, bcuz it's the friggin South!!! Circular argument here. Suffice it to say, that I care, and I wish you to be safe. We need your sparkling commentary to brighten our days. Be safe dearie. Jerr, what do you think about our MaiTai's style sheets? I'm thinking they are D-Y-N-A-M-A-I-T-A-I !!! Forget about dynamite; it falls short. After seeing how she selects/curates each piece, I'm going to take a year or two off of work to go through my wardrobe to cull out all the excess and keep the gems. OMG, my department stores will not love me anymore, but I will love me more for spending less!!! Praying for some better weather for y'all. Hey, sammie, if you can get anyone to pronounce my name correctly, I'll give you a Birkin! It's actually a French name, but boy, it doesn't ever sound elegant and French the way it's pronounced. Oh, well . . . what can you do. Our storm didn't materialize in Metro Atlanta, so other than a sleet shower, my car and I were spared, but you're right, Southerners do not know how to drive in the snow. Heck, they can barely manage rain. I know how to do it, as I grew up on the frozen tundra of upstate New York, but I always had the aid of snow tires in the winter. They don't know what those are down here. Yes, I think MT's styling is wonderful, and I must try and ignore the occasional style blunder, e.g. trend, and get with the program completely. And fun little fact - I was reading the Delta magazine on a flight on Friday and came upon the meaning of Mai Tai. In Polynesian, it means very good. They were talking about the drink, but it certainly carries over to our style guru, as well, don't you think. Are the Anneau Infinity Rings still selling in sets of threes? I hope your weather in the Alps is improving and that you are able to enjoy the slopes. I love your style sheets. Thank you. My color palette has changed over time from warm to cool as my natural hair color is greying. I am becoming a Norwegian blond, one hair at a time. So thoughtful of you to post while you are on holiday. TKO us w/ a feather, my dear! Your inspirations of the sunset and sea belong in an art museum -- the colors, the composition, the everything. What a treat for the eyes/soul. Thank you for sharing w/ us! 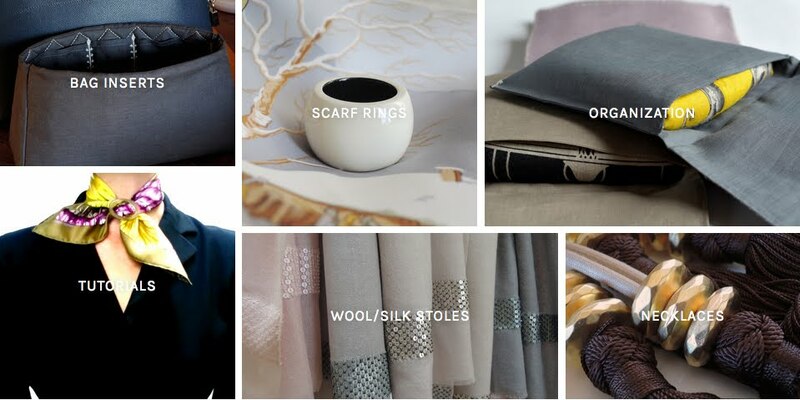 Thank you for showing us how to 'curate' our wardrobe pieces, without a speck of excess or repetition, so that each and every piece remains special, rather than diluted. That is not easy to do. Much easier by far to simply OD on one's favorite color/style. But you've shown us "how", with your genius style sheets; warm/cool dichotomy, winter/spring too, and likely many more to come. I can hardly wait! Annnnnnnnnnnd, if I may gush a little about one of my favorites in your scarf collection: Storm Blue "La Presentation." I have etched in my mind's eye, your wearing it, looking like royalty, with pearls and a simple storm blue/gray chemise. Just like a real princess. But here, you transform it into a smashingly sporty look. The genius of Ledoux's design + the genius of MaiTai styling = d-y-n-a-m-a-i-t-a-i !!! Dearest DynaMaiTai, I wish you a most fabulous rest of the ski vacation with your family, storm or not, treasure every moment. Is there any color that does NOT suit you? That burnt orange top is a treasure, and a wonderful new addition to your wardrobe. But I have also seen you in blue, green, navy, red, yellow, and of course all the neutrals... and you always look simply outstanding. Most of us are limited to only one part of the color wheel, but you somehow manage to conquer the entire spectrum! I like your approach! it is so much easier to admire and follow than those "capsule wardrobe" blogs. a picture really is worth 1000 words! thank you! What's up, I check your blog like every week. Your humoristic style is awesome, keep doing what you're doing! fine however when opening in I.E., it's got some overlapping issues. I simply wanted to give you a quick heads up! Aside from that, wonderful website! one is sharing data, that's actually good, keep up writing.